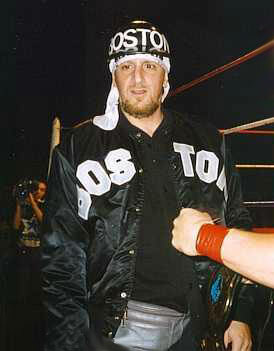 Anthony Magliaro often told people he would sneak into the Boston Garden as a kid to see the WWWF whenever they came to town..
1984: Anthony Magliaro debuted in Angelo Savoldi’s International Championship Wrestling as “Tony Rummell”..
~~~Two of Tony Rummell’s first opponents on ICW Television were none-other-than Abdullah the Butcher and Bruiser Brody! 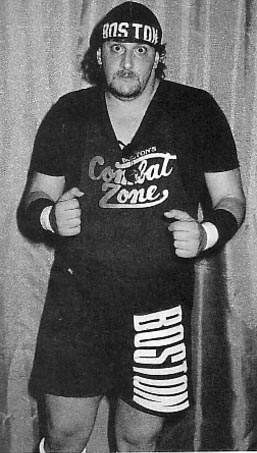 1986: Tony Rumble formed a successful tag team with Rocky Raymond known as “The Boston Bad Boys”..
1987: Tony Rumble began wrestling under a mask as a heel known as “The Dungeon Master”..
1988: Tony Rumble began working as a booker for the ICW TV show and also became one of the top managers in the business..
1989: Tony Rumble managed “The Undertakers” (The Henchman and The Punisher) in ICW..
~~~The Undertakers won the ICW Tag Team titles from The S&S Express, Vic Steamboat & “Jumpin'” Joe Savoldi..
~~~He also led Tony Atlas to the ICW Heavyweight title and The Tazmaniac (aka Tazz) to the ICW Light Heavyweight title! ~~~Tony Rumble also hosted the very popular “Rumble Seat” interview segment on ICW telecasts..
1993: Tony Rumble started promoting his own company in the New England area, called the Century Wrestling Alliance..
January 24, 1998: Tony Rumble was stripped of CWA New England title by Pres. Victoria Van Ellen when the CWA joined the NWA..
~~~The Century Wrestling Alliance would be then known as NWA New England..
October 1998: Tony Rumble led Erich Sbraccia & Knuckles Nelson to the NWA World Tag Team titles at the 50th Anniversary Show..
November 14, 1999: Tony Rumble tragically passes at after a heart attack at the age of 43..
November 22, 2002: Tony Rumble Tribute show takes place at Wrestleplex in Woonsocket, RI..
November 13, 2004–MWF Soul Survivor: Bull Montana won Tony Rumble Memorial Battle Royal..
November 5, 2005–MWF/AWA New England: Ox Baker won the “Boston Badboy Tony Rumble Memorial” Battle Royal..
August 4, 2007–Millennium Wrestling Federation: Rick Fuller won the 4th Annual Tony Rumble Memorial Battle Royal..